It’s only human to be the most interested in our own stories. With that in mind, several medical schools are introducing the importance of genetics by having students analyze the medical significance of their own genomes. “That makes it feel very real and gives real import to what they are doing,” said Michael Linderman, PhD, a computer engineer, computational systems biologist, and bioinformatician who until recently taught at the Icahn School of Medicine at Mount Sinai. Linderman identified a gap in effective genomics education and with colleagues developed Practical Analysis of Your Personal Genome, a laboratory course in which students have the option to obtain and analyze their own genomes. He started teaching the course in 2012 to a diverse group that included MD-PhD students, medical genetics residents, laboratory genetics fellows, and masters in genetic counseling students. 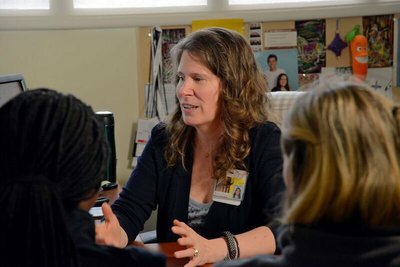 “One of the elements where we needed a lot more education was in the informatics,” said Linderman, currently assistant professor of computer science at Middlebury College. The study of informatics has increased in importance since high-throughput technologies have shed light on the role of the genome in illness. Since developing the course, Linderman has streamlined and adapted it for practicing physicians, nurses, and genetic counselors. He also created shorter workshops for medical students. Linderman believes that students who analyze their own genomes may be more motivated to learn and understand how their patients will respond to the experience. He and his colleagues have undertaken a multiyear research study to follow up on this premise. Some schools are reluctant to allow students to study their own genomes because of the potential for troubling news when students get their results. To alleviate that concern, Linderman’s students were given the choice of working with their own genomic information or that of an anonymous party if they preferred; instructors weren’t told which option the student chose. Linderman said his students showed relatively little apprehension over their genetic sequencing results but noted that, as with any genetic testing, the exercise could prompt “distress and regret.” For that reason, instructors of the exercise are asked to closely monitor students for any sign of distress, he said. An introductory course provides background information for students, and one-on-one genetic counseling is offered without charge as well. The University of Maryland School of Medicine (UMSOM) offers a genetics course as well and addressed some of these concerns through “focused genotyping” of only the pharmacogenetic information from the genome. This means that the testing is limited to the portions most relevant to drug interaction, which cuts down on the possibility that students would receive surprising or devastating personal information. In addition, students have the option of analyzing results of an anonymous third-party genome, said Linda Jeng, MD, PhD, geneticist and associate professor of medicine at UMSOM. The UMSOM course was originally offered as a summer elective but now is a requirement for all medical students. Students take their genetic information with them to second-year classes and evaluate treatment options with their information in hand. For instance, students are asked to pick the best antiplatelet therapy for a hypothetical 60-year-old heart attack victim who had a stent placed. Students are then asked how their recommendation might change if the patient had the student’s own genome?